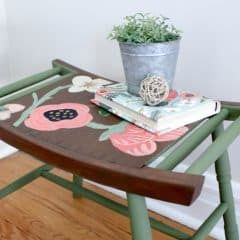 Last month I purchased some chairs on Craigslist, and envisioned an effortless makeover using homemade chalk paint and fabulous fabric. First of all, reupholstering the seats gave me a massive blister on my hand from using the staple gun. I suppose it was worth it, however, because that is the only part of this makeover that turned out well. 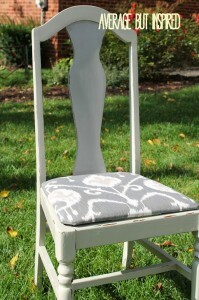 I chose this gray ikat fabric for the seats. 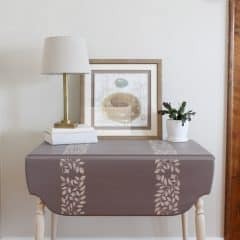 I really like the color, print and weight of the fabric – it is great for this project. The painting part did not go as well, however. 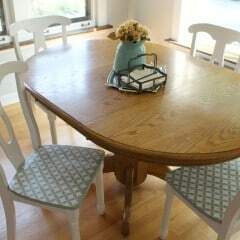 The main paint color I chose looked way too “dead” with the fabric, so I decided to paint the middle top part of the chairs a darker gray color. That made them look a little better, but I still didn’t love them. 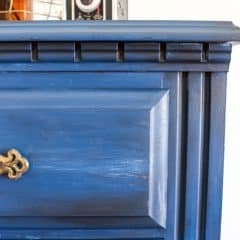 I decided to move on to the finishing part of the project and attempted to use Minwax’s Polycrylic product to seal the paint, as opposed to the S.C. Johnson Paste Wax that I used on my foyer table. Although I really liked the paste wax product, I wanted to try the polycrylic to see what it was like, because other people have had great success with it. I did not. First of all, I thought it was a total pain to apply. It is very watery and thin so it was hard to see where I was applying it and if I was covering all of the paint (which I was not). Next, the instructions recommend that you apply a coat, let it dry for a few hours, sand it, and then repeat that process two more times. That stinks! 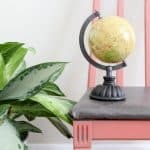 The beauty of chalk paint, in my opinion, is that it eliminates the need for sanding (unless you want to strategically sand to give your furniture a distressed look). Furthermore, this repeated sanding caused some calcium carbonate bits in my chalk paint to show through, which meant that white splotches were appearing all over my smooth finish. To fix this, I tried to paint over those spots, and then reapply the polycrylic. This was a total fail. 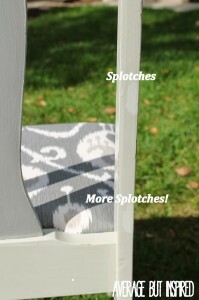 The splotches were extraordinarily visible and made the chairs look even worse. 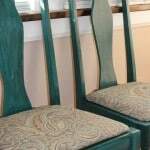 To make matters worse, there were parts of the chairs where globs of polycrylic had pooled, dried and turned yellow – even though polycrylic is not supposed to yellow. It was gross. I’d had enough of these splotchy, yellowed and boring chairs, so on Saturday I bought some new, bold paint and decided to start all over again, this time with paste wax instead of polycrylic. 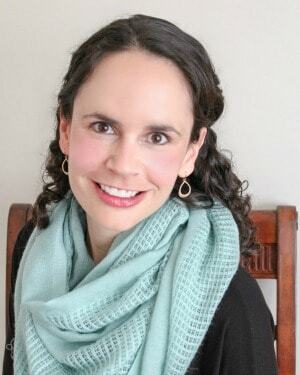 My husband told me I’m insane, and he’s probably right. Oh well, I’m counting Take 1 as a learning experience and looking forward to seeing how Take 2 plays out. Only time will tell. . . I love them! 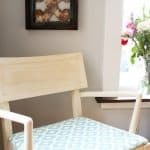 I have been wanting some chairs for our living room, but I am going to wait until we purchase our next home since I want to do a totally new color scheme. Teals, yellows, greys, etc. I have had way too many “Take 2s” so don’t be so hard on yourself! It’s how you learn and get better! I love teal. Like….love doesn’t even describe it. A shade of purple could have been cool as well!